Starting on Fri., Sept. 27th, to Fri., Oct. 4th, I am giving away both my Little Red Riding Hood Drawing Activity Book and my Little Red Riding Hood Literature Extension Pack to one lucky blog reader. If you have noticed, my blog is now called Learn and Grow Designs (formerly: My Shae Noel). I am slowly making the switch over. One thing I am so proud of with these two items is the fact that I used all of my own original drawings to create these to educational items. I love when I can combine my love of art and education into one. 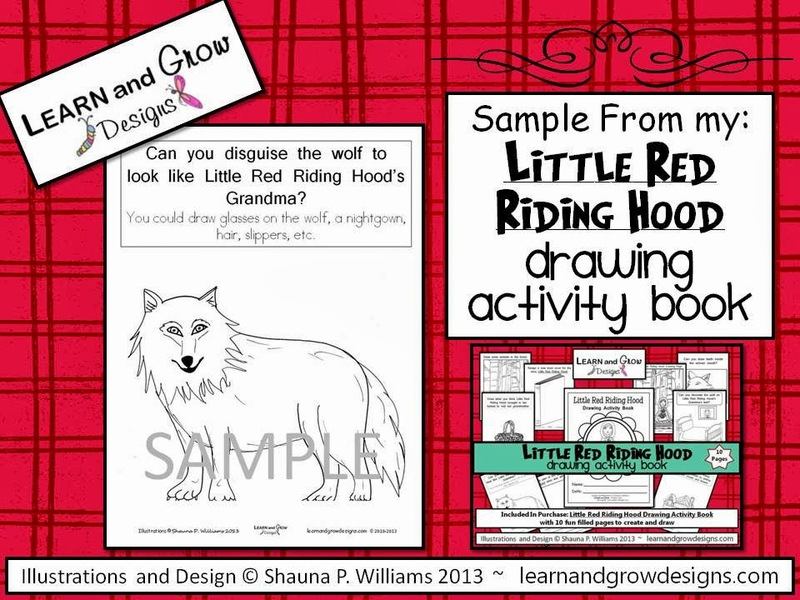 My Little Red Riding Hood Drawing Activity Book is an activity book filled with 10 exciting pages to help you create, draw, and color. 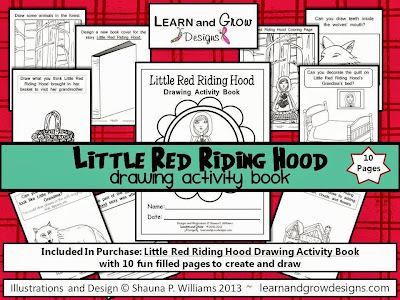 This is an excellent companion to go along with the classic Fairy Tale story of Little Red Riding Hood. 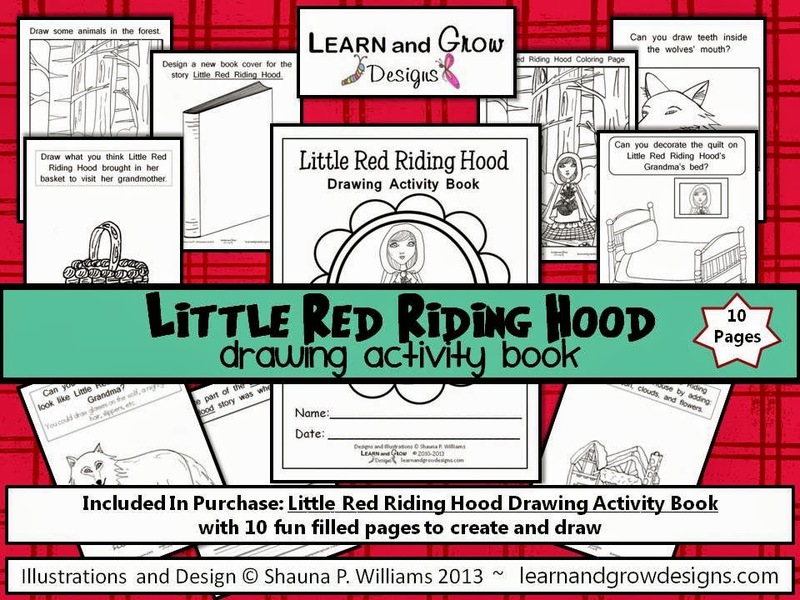 I created this book for my daughter's Elementary School Classroom and they had so much fun drawing and coloring the pages. A favorite page amongst my daughter's classmates was definitely the page where you get to disguise the wolf to look like Grandma. They all did such an excellent job! 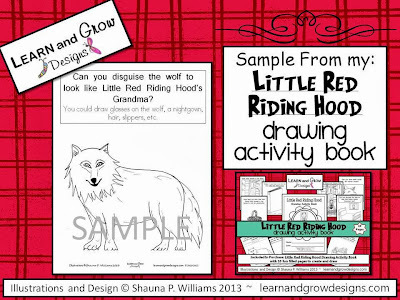 Here is the "Disguise the wolf to look like Grandma" page from my Little Red Riding Hood Drawing Activity Book. 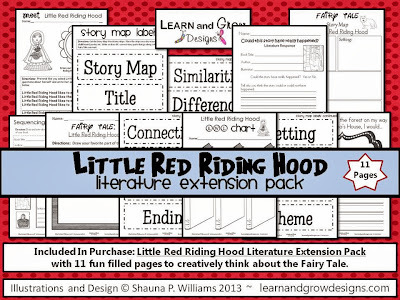 My Little Red Riding Hood Literature Extension Pack is 11 pages fully of activities to help your students creatively respond to the classic Fairy Tale story of Little Red Riding Hood. Along with the different literature response activities such as: a "Little Red Riding Hood KWL Chart", a "Little Red Riding Hood Sequencing Activity", etc., this pack also comes with Story Map Labels that you can use to discuss Little Red Riding Hood such as: "Connections", "Theme", "Similarities", etc. 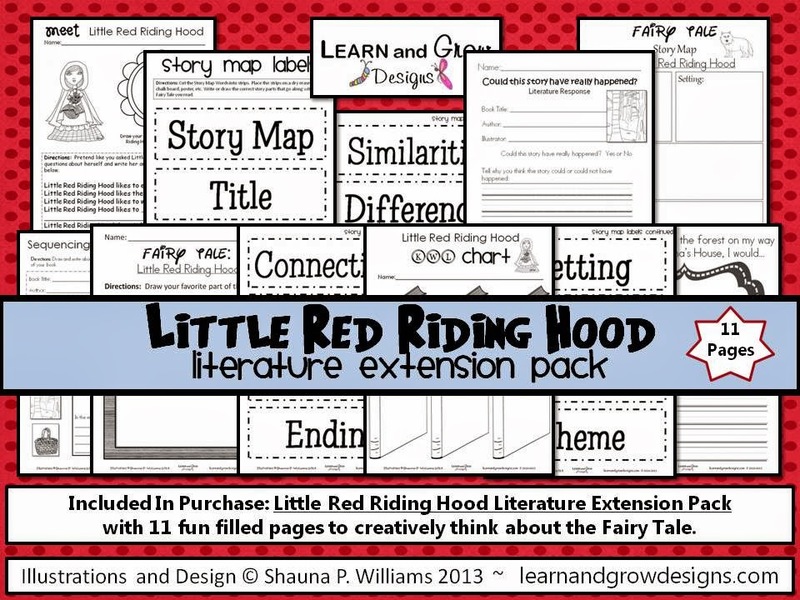 I am already working on several more Fairy Tale Literature Extension Packs at this time. Let me know if there is a specific Fairy Tale pack you would like to see. 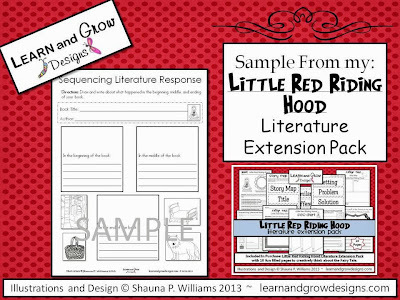 Here is an example of my "Sequencing Literature Response" page from my Little Red Riding Hood Literature Extension Pack. Can't wait to see if you are the winner of this giveaway? You can find these two items in my Teacher's Notebook Learn and Grow Designs Shop: HERE and in my Etsy Learn and Grow Designs Shop: HERE. 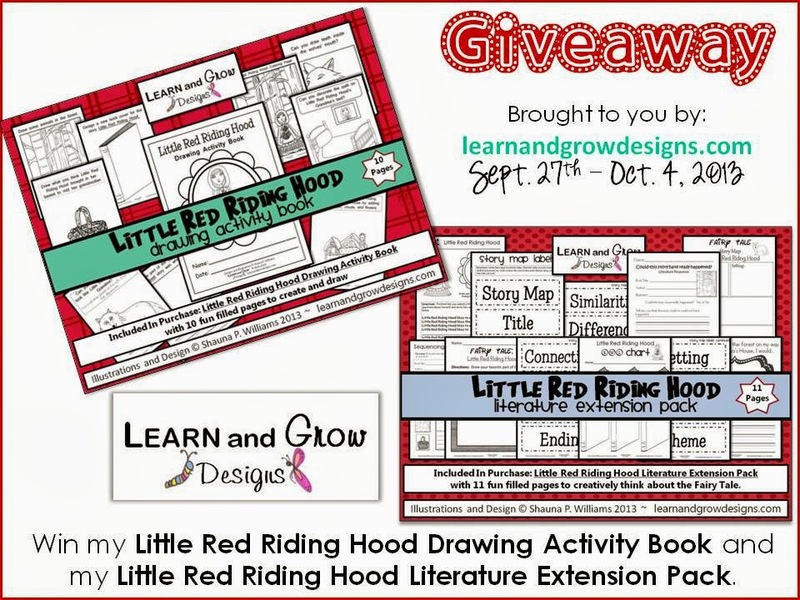 You can also have a second chance of winning my Little Red Riding Hood Drawing Activity Pack by visiting my Teacher's Notebook Giveaway: HERE. To enter the giveaway simply follow the Rafflecopter instructions below. One winner will be announced on Sat., Oct. 5th. This contest is open to international blog readers too. Winner must be at least 18 years old. Winning prize will be e-mailed to you as a digital PDF files. No hard copy will be sent to you. Good luck! These are fantastic. I love the activities and the illustrations. Adorable! My daughter was little red riding hood for halloween last year & she would love these!